The green peppers are jalapeños, with seeds. The red ones are Chinese insanity peppers. Verdict: Delicious, with a side of sweating. The crizy chicken was certainly not “Thai hot,” probably because the waitress informed me that she warned the kitchen that I was American. I didn’t have the heart to tell her I was Canadian. We also had dumplings, of which not even a picture remains. Admit it. You have no plans this weekend. There is no NFL football to watch, and you don’t care about the NBA until the playoffs. Exercising is for losers who actually stick to their New Year’s resolutions. So get off the couch and get active — go taste some beers and scotches. If you start your Friday and Saturday nights off with these two events, we guarantee that your late-night F. Jones Corner dance skills will quadruple in awesomeness. * Friday Night – Lazy Magnolia / Raise Your Pints cask ale beer tasting at Brent’s Drugs in Fondren. Word on the street is that the beer is free until the cask runs out, and is only $2/red cup afterwards. I’m sure Brad Reeves will be slingin’ burgers as well. 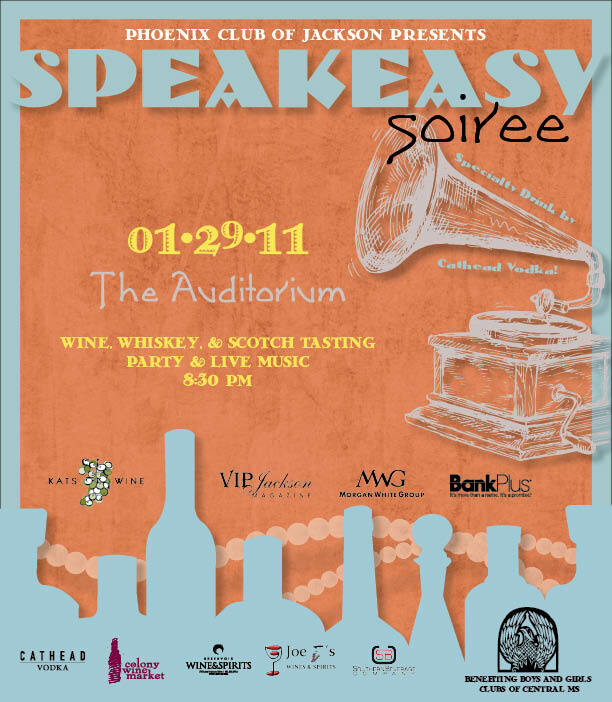 * Saturday – The previously-reported Speakeasy Soiree, benefiting the Boys & Girls Club of Central Mississippi. Once again, it’s for the kids. Leave a comment if we have left out any event worth mentioning. Who isn’t sick and tired of scotch and wine. Those beverages are so winter. I mean, crawfish season is practically here, and nothing says going to bed before sundown like trying to cool down your spicy crawfish mouth with scotch. Luckily for all of us, and especially our spouses, the best crawfish-eating beer in the world is out and ready to cool you down in 2011. Unfortunately, “In Stores Now” apparently does not include stores located within a 10 mile radius of Jackson, Mississippi. But, as my old friend Paul Lennon used to say during jam sessions with the Rolling Stones, that’s “nothing to get hung about.” Check back here daily – or hourly if you prefer – for Abita Strawberry sightings around the greater Jackson area. And if you spot some, why don’t you tell everyone about it here. We here at FBOFW are always looking out for the welfare of the Capital City’s younger residents. Therefore, I encourage everyone to attend the Speakeasy Soiree on Saturday night at the Auditorium. Proceeds benefit the Boys & Girls Club of Central Mississippi. Start your evening with a tasting of fine wines, whiskeys, and scotches under the direction of select local vendors and enjoy a specialty drink from CATHEAD Vodka. Then spend the rest of your evening dancing away to to the music of The Heather Hayes Experience from Atlanta. Tickets are only $40. The Steam Room Grille was a steak/lobster restaurant in a highly visible location on the I-55 North service road. Despite passing it thousands of times, I never stopped by to eat. Apparently I was not the only person who drove past it without stopping, because it shut down in the latter part of 2010. 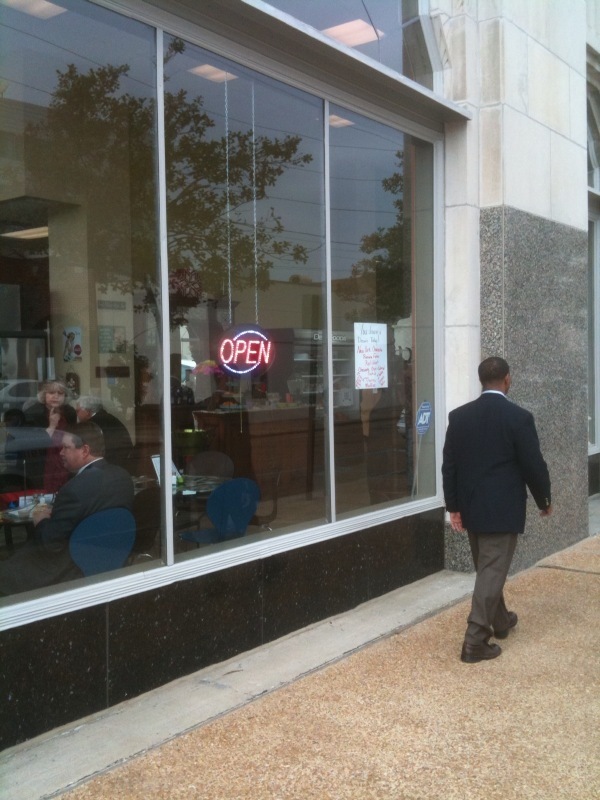 However, the Grille recently moved and rebranded itself as the Downtown Cafe. 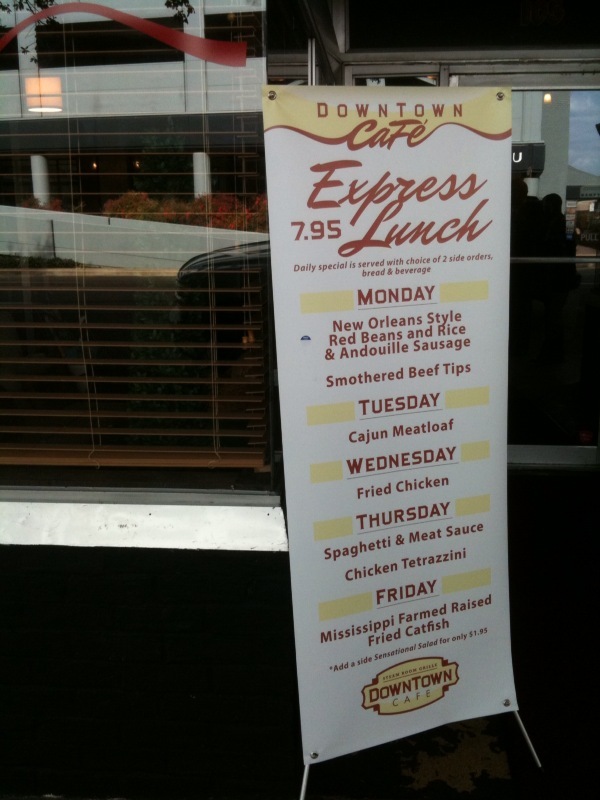 Located on Capitol Street in the bottom floor of the former Club Touch / Taste Lounge* building, the Downtown Cafe offers a variety of plate lunches, poboys, wraps and burgers. In other words, it is a typical Jackson lunch spot. As it was Monday and all restaurants within a 200 miles radius of New Orleans are required to offer red beans and rice on Mondays, we went with…the red beans and rice. Ha, you thought I was going to say the catfish poboy didn’t you? 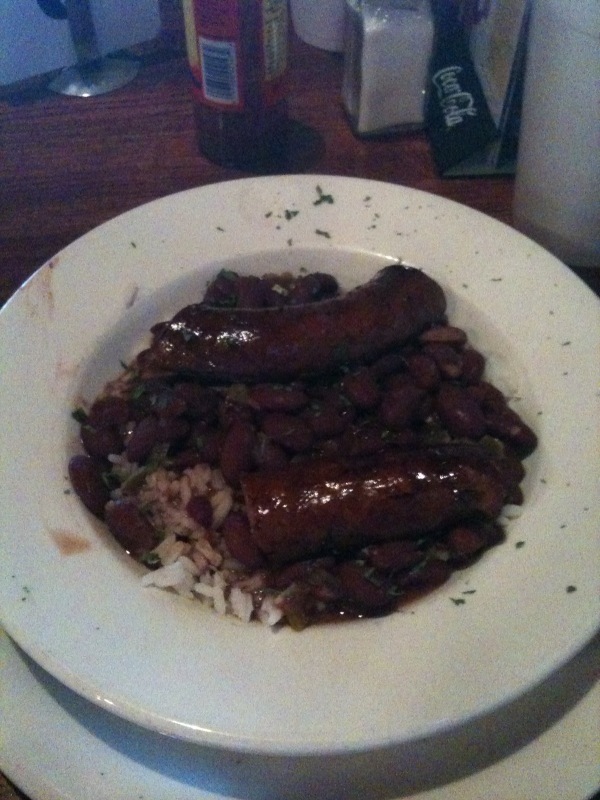 Despite the horrible picture, it was actually a pretty good plate of red beans, rice and sausage. The beans were well-seasoned and cooked al dente, rather than the mush that is sometimes served. The sausage had some bite, and the Cafe offers both Tabasco and Louisiana brand hot sauces. Not bad for $7.95. You have the choice of two sides from a list of approximately two thousand. The skillet corn was a tasty choice that, once properly salted and peppered, hit the spot. 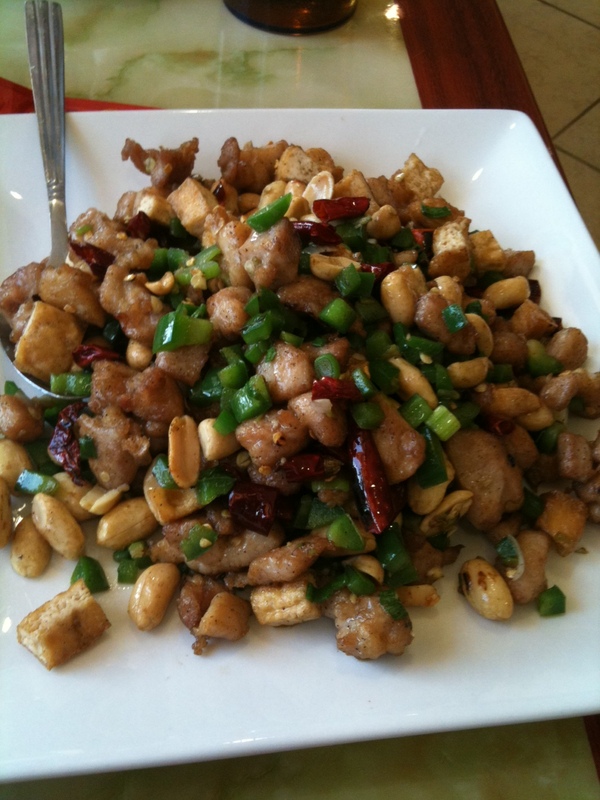 The greens were cooked with some type of pork product and were therefore elevated to delicious status. 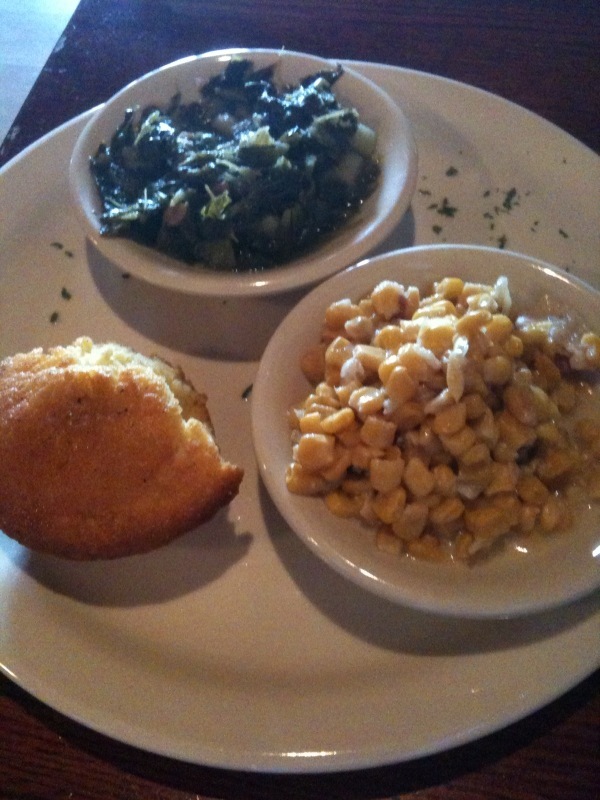 The cornbread was dense and sweet, just like my dog. Overall, the Steam Room Grille Downtown Cafe is a long-named, worthwhile addition to the downtown lunch scene. Others have noted that the ordering system – you order and pay at the counter – is dysfunctional and causes a long, slow-moving line to develop. Fortunately, we evaded those problems and our food was brought to our table within minutes. * A classy establishment whose passing will be missed. Also known as the former Gator’s and CatWalk building. Once upon a time, back when my wife was not yet my wife, she lived in uptown New Orleans in a great house in a cool neighborhood. But the house had one major flaw. It did not have a grill (and did not have a dishwasher, but that’s another story). So being the generous boyfriend that I was, I went out and bought her the finest grill the Tchoupitoulas Wal-Mart had in stock. The grill eventually made its way to Jackson, where it has taken a backseat to both the Big Green Egg and the gas grill. But on Thanksgiving, all other grilling spaces were in use. Where am I supposed to chargrill the oysters? Obtain three dozen oysters in the shell (locally I get them at Paul Anthony’s Market, Fresh Market or Kroger. The New Orleans Fish House may have them as well). Shuck said oysters and place on a tray. Fire up the rusty old grill and get it hotter than fish grease. 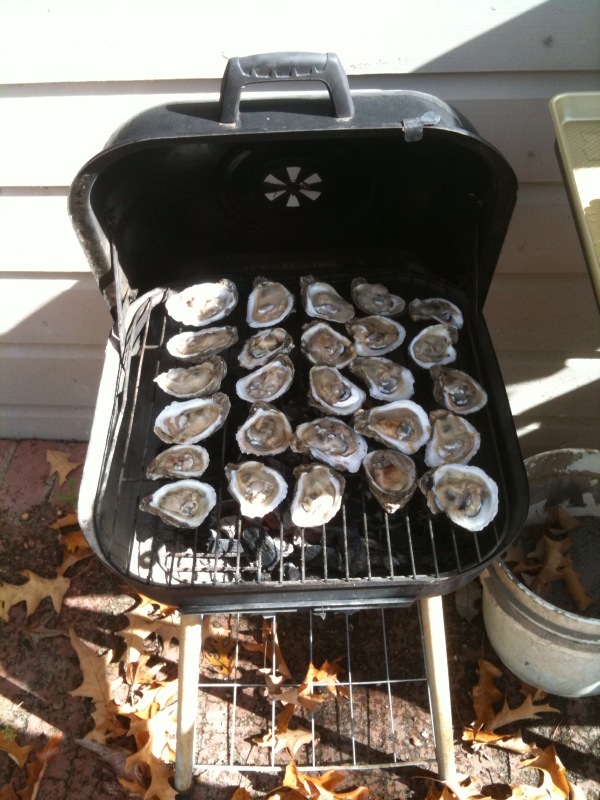 Put the oysters onto the hot grill as shown in Exhibit A. After a minute or two, spoon a mixture of melted butter, lots of minced garlic, salt, pepper, and minced parsley over the oysters and watch the flames rise. My singed arm hairs recommend that you wear a protective mitt while doing so. Throw on some Parmesan cheese as soon as practicable, melt the cheese, and remove the oysters to the tray. 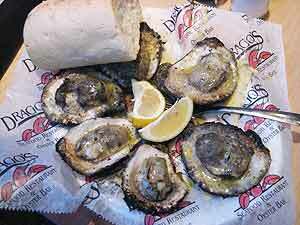 Eat immediately and keep the chargrilled oysters’ existence a secret until you have had at least six. Use crusty bread to soak up the garlicky oyster butter. While not everyone may have a dedicated oyster grill, they should. If you do it right, your oysters will taste as good as this restaurant in Metairie that stole my idea. So it was a warm winter’s night and the fridge was bereft of legitimate meats or vegetables. McDade’s market is nearly a half mile away and clearly not an option. What is a poor newlywed couple supposed to eat? 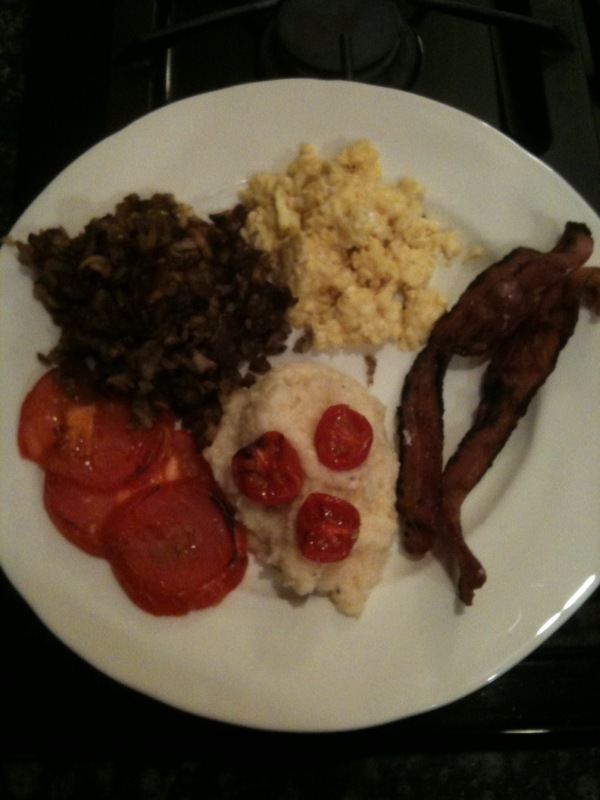 Bacon, eggs, hash browns, grits and broiled tomatoes? For dinner? Well OK.
Fire up the Big Green Egg and get a cast iron skillet super hot. Add butter and frozen hashbrowns, and crispify. Slap on some bacon, cook, and immediately eat as you watch the hash browns get crispy. Do not tell anyone about this step. Then cook some more bacon to put on the plate. Place five beaten eggs in enameled dish and cook gently until scrambled but still soft. Back in the kitchen, boil a small pot of water and add 1/2c of quick grits. 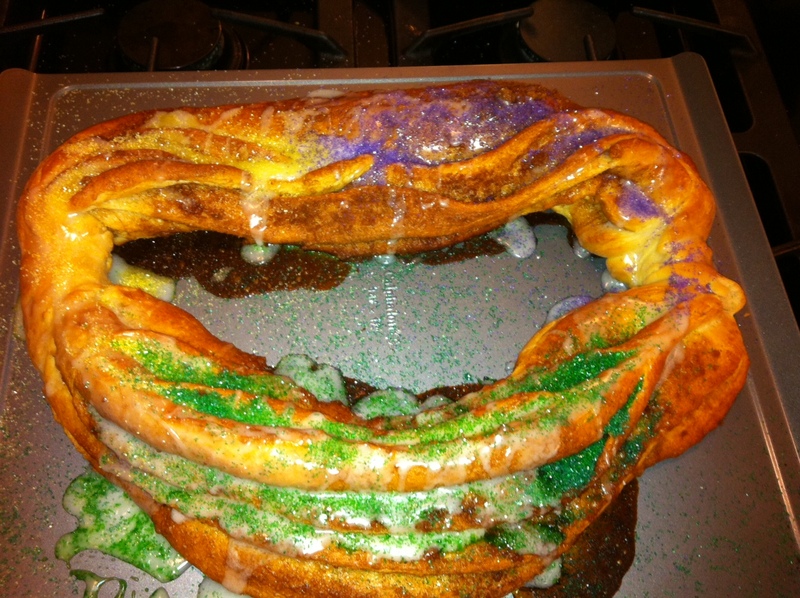 Once cooked, add some jalapeno Mississippi State cheese spread. This combination is awesome. Dip bacon into cheese grits for a classy hors-d’oevres. Broil one ripe tomato and a bunch of overripe cherry tomatos, salt liberally, and plate everything up real purdy-like. You learn a lot in the early months of marriage or at least that’s what I am told. Whether it be the marriage or by chance, I have learned the definition of what sounded like a familiar word. Budget, I believe in France the “t” would be silent. Mais oui, my point. We are not in France and with my new (forced) vocabulary sticking to my mind like a fresh coat of paint I start my journey into the D.I.Y. cost effective lifestye. merd. Our kitchen is the pulse of our home. We start our mornings in the kitchen sipping chickory Community coffee. Oh who am I kidding, chugging coffee as we race out of the door. 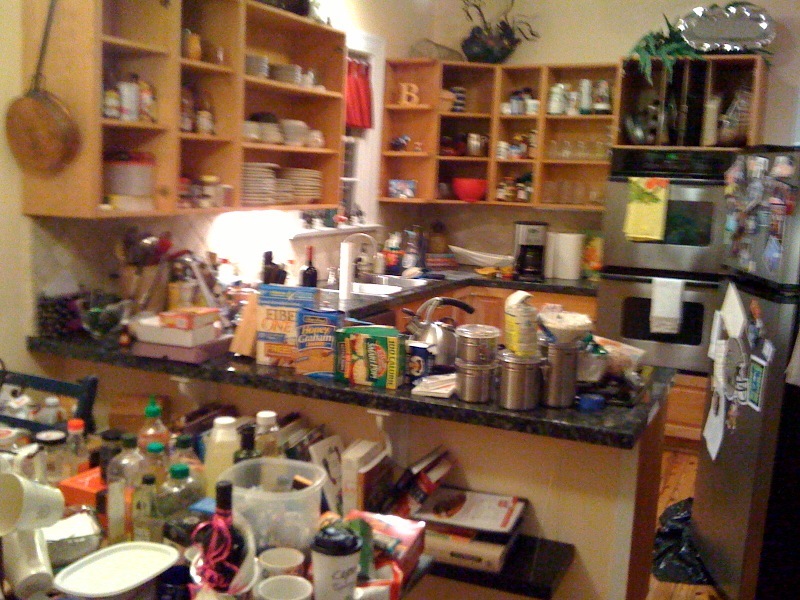 We end our nights loading dishes into the sink dreaming that when we reach into the cabinet the next morning to get our coffee mugs there will actually be a clean cup resting on the shelf (just one cup is fine with me, I leave for work a hour before Quin). However, these days the only thing that rests on our shelves is the newest coat of Annapolis grey that seems to be on it’s own drying schedule and not mine. 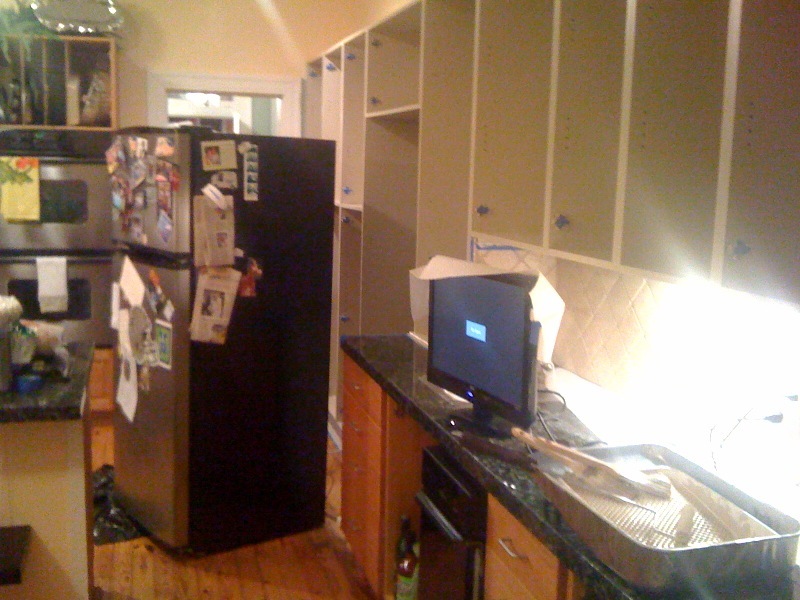 We spend so much of our time in our kitchen we decided to give the old gal a much needed facelift, Day 1 has turned in to Day 8. There is no sign of the end. The quality of the work is AMAZING, undoubtably that of a professional. But before you put your wife on a budget, what amount of money is worth saving if you live like you belong on Hoarders? Like I said, you learn a lot in the first few months of marriage. I’d love to learn the number to a professional painter in the Jackson area. I’ll post photos of the completed project. See you in 2012! The western edge of downtown Jackson has really taken off in the past year or so. The King Edward restoration/conversion, at the heart of the renaissance, was quickly followed by the restoration of the Standard Life building and its conversion into apartments. But downtown Jackson was a food desert; there was not even a single place to buy a six pack of beer. Enter Bodega. Located on the ground floor of the Standard Life building, Bodega fills a much-needed void. They sell groceries and beer, and serve breakfast (all day! 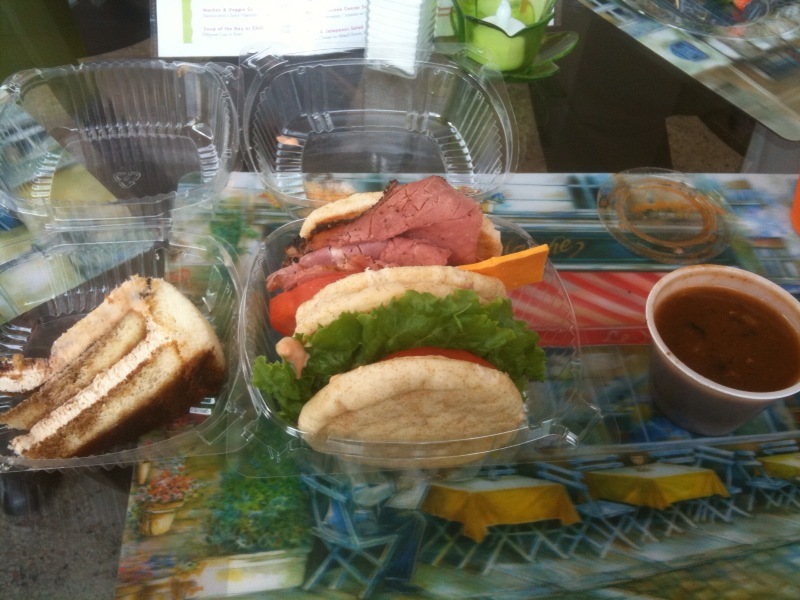 ), plate lunches and sandwiches. We caught them on their ribbon cutting, and they were serving a special menu. Not a bad deal for six bucks. Black bean soup (passable), pastrami (great) and turkey (good) sandwiches, and tiramasu (excellent) were served in a heavy-duty Bodega lunch sack. Of course I need two sandwiches for lunch, don’t be silly. They have about six large tables that fit in nicely with the art-deco character and feel of the building. The standard menu prices looked ridiculously low – think $4.75 for a burger – and had some interesting variety. 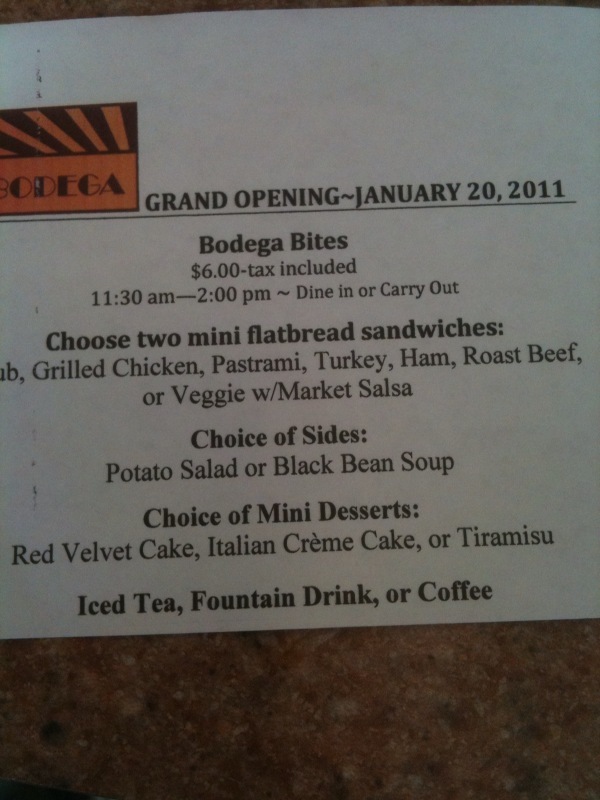 Bodega is an instant go-to for the downtown living crowd, and will probably be a hit at lunch as well with prices like that.